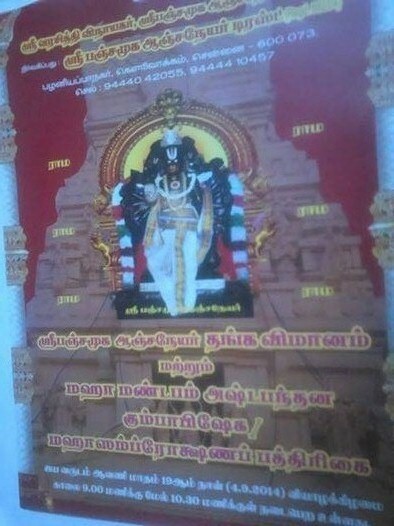 The Pradhista of Sri Pancha Mukha Anjaneyar Golden Vimanam and Mahamandapam Asthabhandana Kumbabhisheka / Mahasamprokshanam will be held on Thursday, September 4, 2014, at Sri Varasiddhi Vinayakar and Sri Pancha Mukha Anjaneyar Temple, Palaniappa Nagar, Gowrivakkam, Chennai 73. Several priests began a special "Aishwarya Puja" (attainment of wealth and prosperity) at Navagraha Temple, Chandan Nagar, Pune, on a scale which is a first-of-its-kind. Readers can join the Sankalpam from any part of the world. The Puja will be on till August 29, 2014. The yagya would be offered to Bhuvaneshwari Devi, Kamala Devi, Kaali Mata, Shri Mahalakshmi, Shri Ganesha and Shanishwara Dev. Easily the most impressive part in the first day's events of the Aishwarya Puja at Pune was the Agni Manthan. An observer said, "I had always heard of it, but never seen it before". He had heard of such an experience at Kancheepuram and Varanasi. On the occasion of the 80th birthday -- Sathabishekam -- of Sri Jayendra Saraswati Swamigal of Kanchi Kamakoti Peetam, legendary musician Shenkar (Vocal/Double Violin) was presented the Asthana Vidwan title of Kanchi Kamakoti Mutt. Sri Thirumeni Guruji performed a grand Bhagavathy Seva/Thiruvilakku Puja on Saturday, July 26, 2014, at Jnanodaya Alayam, Samiyar Madam, Ashok Nagar, Chennai for the benefit of entire mankind. Sri Thirumeni Guruji has been regularly performing the Bhagavathy Seva every month in Chennai for the benefit of one and all. Bhagavathy Seva/ Thiruvilakku Puja is the worship of Devi Bhagavathy, which is believed to bestow all kinds of benefits to the devotee and also serves as a protection from all miseries and evils. Sri Thirumeni Guruji has gained name and fame for the puja-s and homa-s/yagna-s that he conducts for the welfare of the people. He is very well-known for performing the Bhagavathy Seva (worship of Devi Bhagavathy, which is believed to bestow all kinds of benefits to the devotee and also serves as a protection from all miseries and evils. 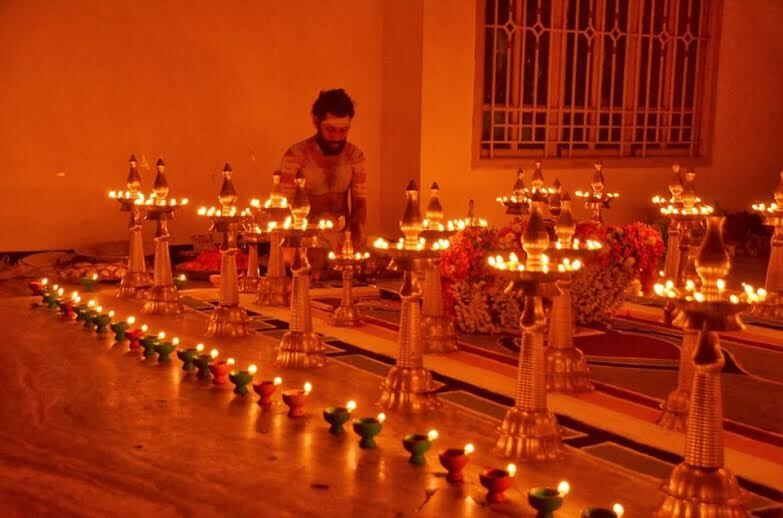 The performance of the Bhagavathy Seva once a month is considered to be equal to visiting the temple for thirty days). Ekasham Shailkritya Mandir Samooh, or the Rock Cut Temples of Masroor, Kangra are among the best such rock temples in the world. It is an outstanding example of monolithic temples in the Himalayan region. The entire complex comprises of more than 15 temple shikhars and a large water pond. Everything has been carved out of sand stone rocks. A huge hill has been modified into a series of temples. 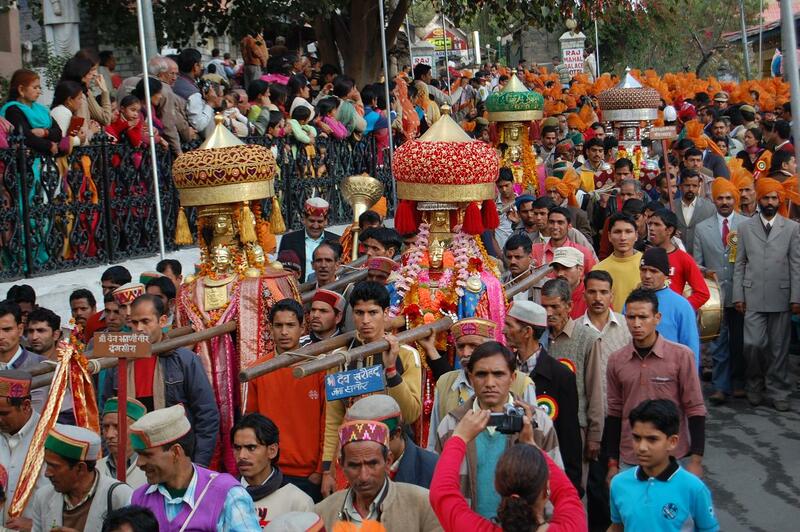 The historical Shivratri fair of Mandi, which was started by Raja Ajber Sen in Purani Mandi around 400 years ago, revolves around Mado Rai (Lord Vishnu) temple and Bhootnath temple (Lord Shiva) of Mandi, which has 81 temples within the town and is popularly known as Chhoti Kashi.